Some say it tastes like dirt, while others say it's like a "walk in the forest." What in the world does juniper taste like? Fans of Starbucks can now find out by trying the latest wintry drink to join the coffee chain's menu: the Juniper Latte ... or, you know, just take a sip of gin. Either way. 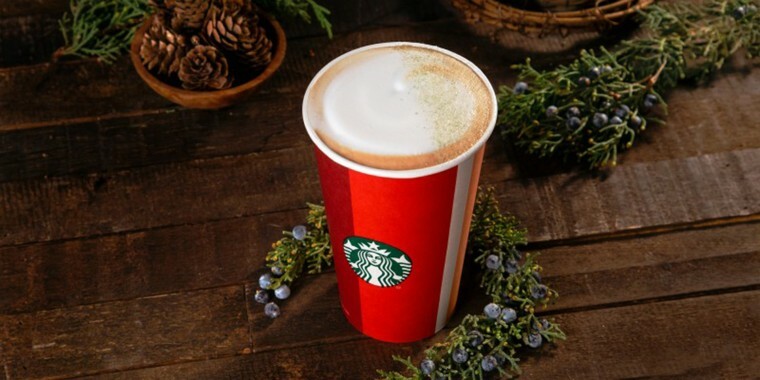 The drink, which Starbucks describes as featuring a "hint of juniper and sage, an evergreen aroma and citrus notes," is made with the company's signature espresso and steamed milk that's been infused with "juniper syrup." It is then topped with foam and green pine-citrus sugar. According to a press release, the drink first debuted last year at the Starbucks Reserve Roastery in Seattle, but this is the first time the drink is available at coffee shop locations nationwide. Juniper berry, known for its sharp, pine-forward and slightly citrusy tang, is the main flavoring agent in gin — which is not generally an alcohol that pairs well with coffee. Whiskey or rum, maybe ... but gin? Not so much. Starbucks fans who heard about the new drink also weren't so sure about the pairing of the piney flavor with coffee — or that anyone would want to drink pine-flavored anything! But of those who have actually tried the new drink, which was released Tuesday, the reaction has been largely positive, with only a handful of people online giving it the thumbs down (one person actually described the beverage as tasting like "grass and dirt"). Others were surprised to find that they actually enjoyed it. The drink even inspired pure poetry from one taster. A "whisper of snow"? We could cry. In addition to the Juniper Latte, which customers can order hot or cold, there's also a Juniper Frappuccino on the menu, which is also made with juniper syrup. Customer can choose between a cream base or blended coffee version. Here at TODAY Food, we gave the Juniper Frappuccino Blended Coffee a try and, despite being sure it would taste the way Pine-Sol smells, we were pleasantly surprised. The drink is actually pretty tasty with no lingering aftertaste and just a hint of pine amid the sweetness. Our refined palates could not, however, detect the citrus. Want to try it before you knock it? The grande latte clocks in at 260 calories, while the grande coffee Frappuccino made with whole milk has 370 calories. Other new flavors on Starbucks' holiday menu include peppermint, gingerbread, caramel brûlée, chestnut praline and eggnog. But before you start spending big bucks at Starbucks splurging on holiday specials, check out these stealthy hacks to save money on your next coffee run.